"Drumming has always been my passion, so when it comes to high quality drumkits I choose Yamaha. I love the perfect tone for live performances to studio recordings and their hardware is always high quality and reliable." 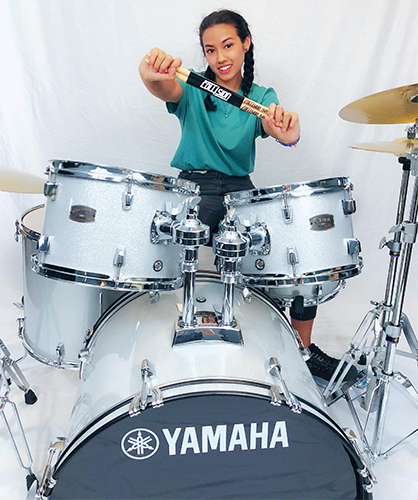 Beginning her musical journey in an all sister band at a very young age, Naomi started out playing home made instruments like a water bottle with rice in it and quickly gained her rhythmic ability. Her talent soon branched out to discovering the bongos and she eventually found her way to what she calls 'a brilliant creation'; the drum kit. She loved the idea that you could hit the instrument hard, create different rhythmic beats in different tempos to different genre's of music. She was 5 when this started to emerge then 8 when she decided that she wanted to make playing drums her career. Over the many years Naomi has been lucky enough to perform & record both locally and internationally with her sisters and branch out as a session player for some of Indonesia's biggest bands/artists like SLANK, Anji, Ungu & many more. Moving back home to Australia in 2017, she found her way into an all girl band now known as Chasing Velvet. They released their first EP 'WINGS' early in the 2017 & wrapped up their first Australian tour in October.